When enabled (Settings -> Auto connect), application will automatically try to connect when launched or resumed. Auto connect won't be triggered when connection is lost while using the app. Accidental clicks that appeared when using mousepad (fast finger movements) are now eliminated. 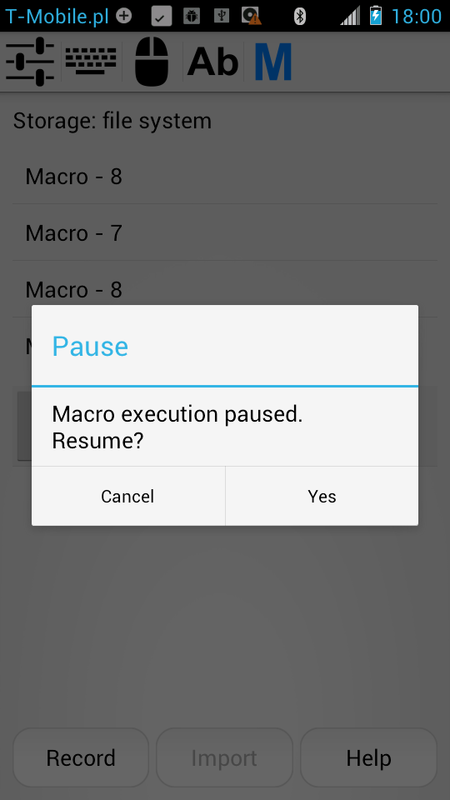 When "pause" action is used, macro execution will be paused until "Yes" button is clicked. This can be useful when you need to wait for some time consuming operation (like starting an application or opening a file on USB host) to finish before proceeding with macro execution. 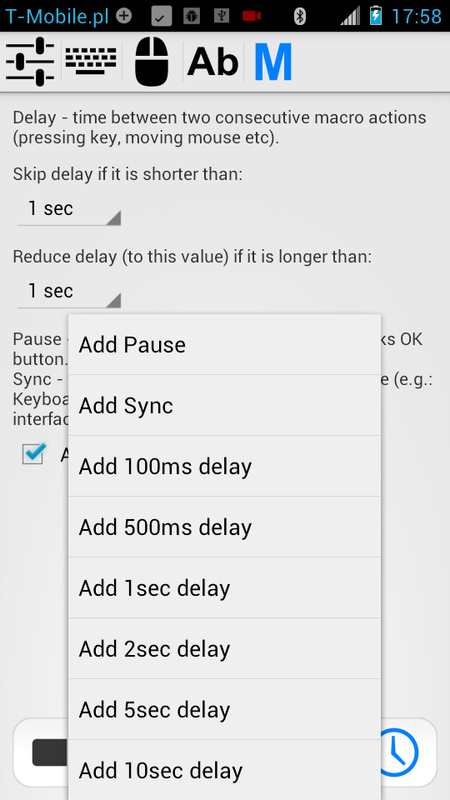 When recording a macro, use "Timer"icon to add "pause" action. If /USBRemote/Macros/autoexec.txt macro file is present it can be automatically executed as soon as connection is established. Useful for time critical situations, like entering BIOS before OS starts to boot. 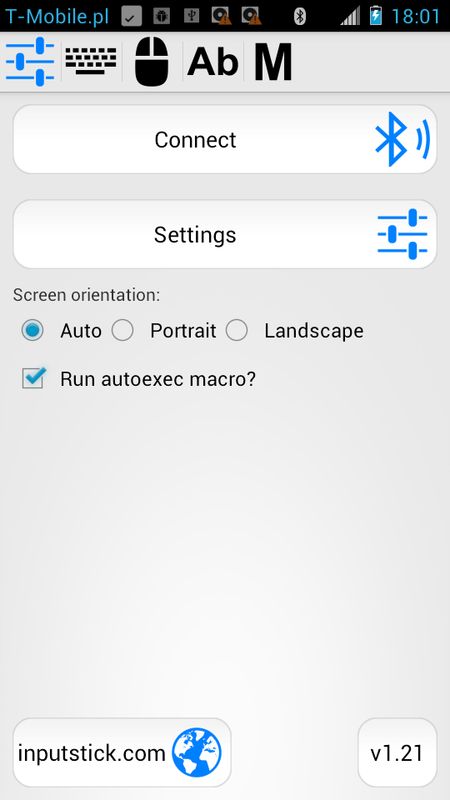 Checkbox "Run autoexec macro?" must be checked (each time) before connection is established. The checkbox won't be visible if autoexec.txt is not present. Note: "pause" macro actions will be ignored in this case. 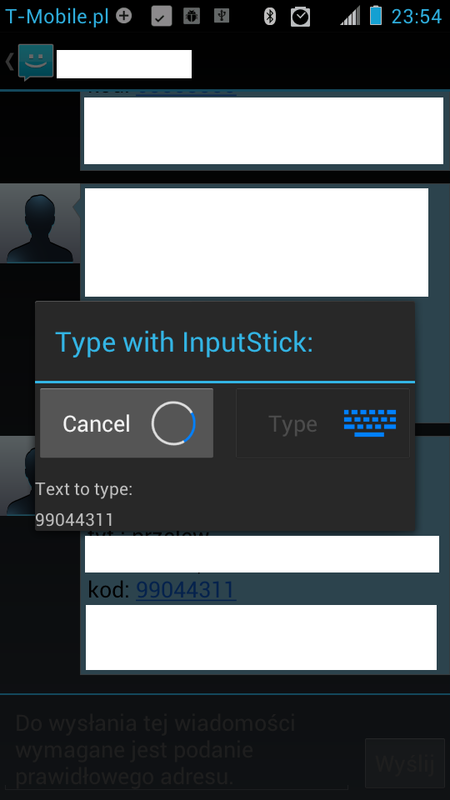 Now you can use InputStick to type: text files, phone numbers, URLs, email addresses etc (anything text/plain for SEND and VIEW actions). 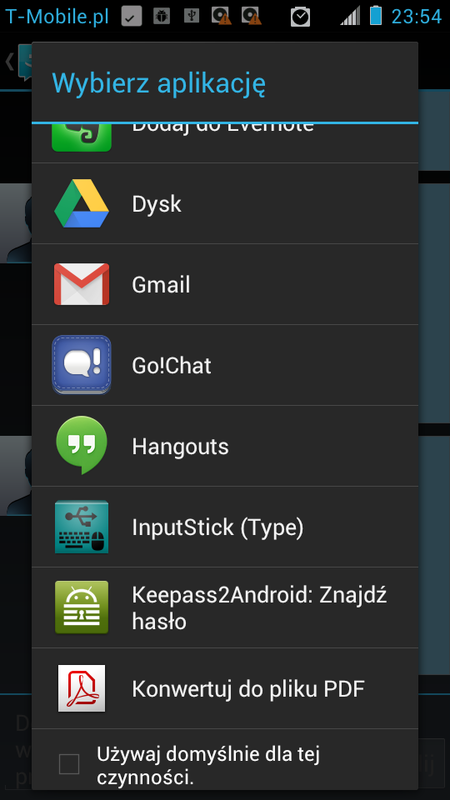 Auto connect - if InputStick is not connected,application will automatically try to establish connection. 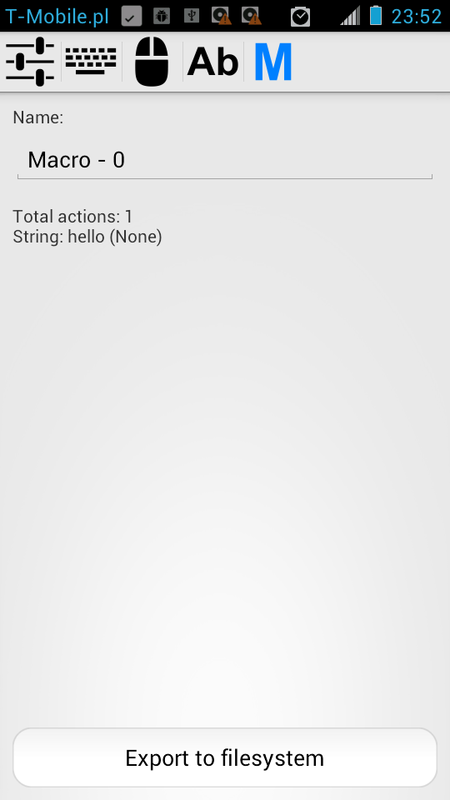 Auto type - will start typing text automatically. Be careful with this! Auto close - activity will close itself as soon as it is done with typing text. Macros can be now exported to .txt files in /USBRemote/Macros/ location. 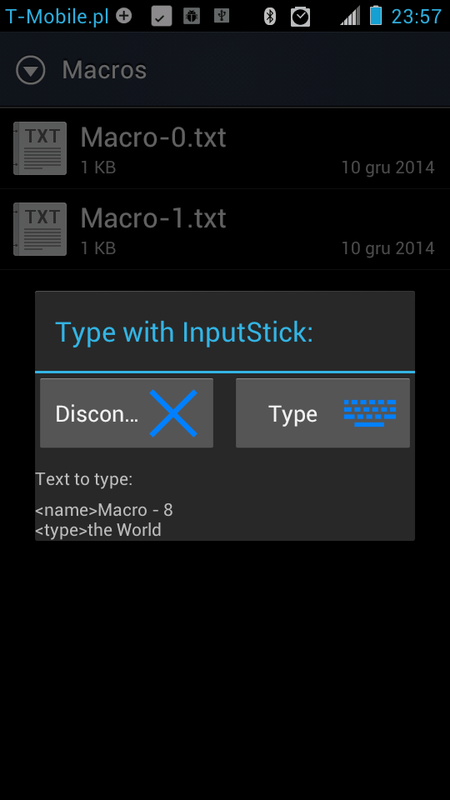 You can edit such macro file using any text editor (on your phone or on PC). You can also send such files to some other device. Note: after editing such file, it has to be imported into internal database (or you can entirely switch to use file system for storing macros, more details later). Macros from /USBRemote/Macros/ directory can be imported into internal macro database. 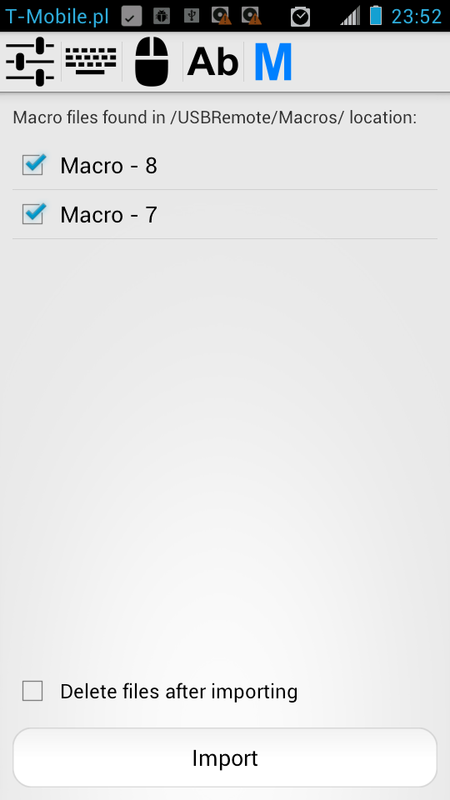 You can also set /USBRemote/Macros/ directory as a default storage location for macros. In Settings screen, click on Macro storage and choose: File system (.txt files). In such case internal database won't be used. You'll probably want to export your macros before switching to this option. Now it is no longer necessary to do anything after editing such macro, it will be loaded from file before executing. There are also some UI changes. Last but not least, new line and tab characters are now supported when typing text.